Bakugan Battle Gears can be use to attach to most Gundalian Invaders Bakugans to increase G-power, or they can by played just like any other Bakugan. Battle Crusher is a Battle Gear that resembles a serpent made out of crystals. The crystals can absorb the opponent's attack and send it back with incredible power. The cannon on the top of Battle Crusher can also shoot a beam that can by only destroyed by a very strong ability card. When Battle Crusher attaches to Aranaut, it surrounds him as a shield in defense and has a cannon for offense. 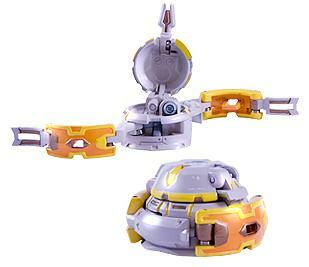 Battle crasher can play two roles, and is common among haos, and sub-terra attributed bakugan. Power also varies within the opponent power, which means The wearer can outsmart, and overpower his opponents. Purchase your Battle Crusher Battle Gear from Amazon now!